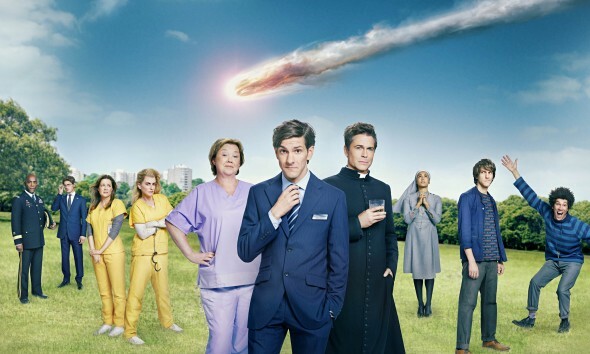 Performers include: Mathew Baynton, Joel Fry, Pauline Quirke, Jenna Fischer, Kyle Soller, Rob Lowe, Gaia Scodellaro, Paterson Joseph, Megan Mullally, Diana Rigg, and Fabian McCallum. This dramedy TV series revolves around the last days of mankind. When word gets out that a comet is on a collision course with Earth, an unexpected chain of events is set in motion. What will people do in the 34 days they have left? Against a backdrop of apocalyptic chaos, an eclectic group of seemingly unconnected characters from around the world begin to intersect in unexpected ways. They each cope with the impending end of the world in his or her own bizarre way. Father Jude Sutton (Rob Lowe) is a rebellious and foul-mouthed priest and he’s aided by his timid assistant, Sister Celine Leonti (Gaia Scodellaro). A mild-mannered librarian, Rhonda McNeil (Jenna Fischer) finds herself dangerously out of her depth when she is sent to a maximum-security prison for a crime she didn’t commit. Rhonda unwillingly befriends Leanne Parkins (Megan Mullally), an unhinged white supremacist who takes the deeply reluctant librarian under her wing. Morally dubious (but intensely loyal), Leanne is a woman who is uniquely suited to surviving the end of times. Rhonda’s twin brother is Scotty McNeil (Kyle Soller). He’s a member of the Specials Situations Group — the underfunded department responsible for planning the official U.S. government response to apocalyptic scenarios. He works with his boyfriend, U.S. General Arnold Gaines (Paterson Joseph) to try to stop the comet. Meanwhile, Jamie Winton (Mathew Baynton) is a humble bank manager from Slough who is hopelessly stuck in a rut. He lives with his adoptive mother, Paula (Pauline Quirke), and Dave Bosley (Joel Fry) is Jamie’s laid-back best friend. Jamie’s still in mourning over the mysterious disappearance of his wife, Layla, seven years ago. Spurred into action as a result of the impending apocalypse, Jamie embarks on a perilous quest to finally find his loved one. Jamie learns that he has an estranged twin brother named Ariel Conroy (Mathew Baynton). He’s also known as the White Horse and is the leader of a cyber terrorist group called Deus Ex Machina. Some of the misfits are destined to make it to a safety bunker that’s deep beneath the English suburbs of Slough. They will ultimately become the unlikely (and totally unsuitable) future of mankind. Rhonda is reunited with her family as they fly to the bunker in Slough. When a piece of the comet hits the jet and forces them to crash-land two miles from their destination, Rhonda is forced to make a difficult moral decision. Frankie follows the voice in her head to find Paula and Dave and lead them to Jamie in the bank vault, where Jamie learns Dave and his mum are married, and they learn Ariel has assumed Jamie’s identity. Celine gets a surprising message from Jude’s spirit. Layla figures out Ariel isn’t Jamie and makes a harrowing escape. She reunites with Jamie and the gang, and when they encounter a downed bridge, Jamie does something that stuns everyone. First aired: March 31, 2016. What do you think? Do you like the You, Me and the Apocalypse TV show? Would you have liked to see the characters return for a second season? yes, the show is timely and it is a lot you could do with it right now with the spiritual awakening going on. I still miss the show and wonder what ever happened to everybody. My husband and I loved this show… it was great fun! We loved this show and we’re looking forward to the next season! It’s pretty sad that they cancel good shows and replace them with crap then fans are left hanging. Wake up NBC! By all means, if you have a good thing, lets cancel it & replace it with some more BS reality TV! I hate that this show was cancelled!!! I sure miss this show! I wish I had a way of following the story line if they won’t bring it back. Does anyone know if it was based on a book? I loved this show! Creative, original. Sad if it doesn’t return. I haven’t laughed so hard in a long time. I loved. it. I looked forward to it. Please don’t cancel…..
My family really loved the show and were saddened that the show is cancelled. We would like this to be an ongoing series.